This week isn’t about looking back but about looking forward. OneGiantStep is going to Japan!! Japan was to be the final country in our RTW trip but, as we headed into South East Asia, we knew that our budget was just not going to stretch far enough for us to really do it justice. Japan is expensive; there is no way around it and we wanted to be able to enjoy it and not worry too much about what it was costing. We decided to drop it but agreed that Japan would be the first place we visit post RTW. It’s time! Besides saving money for our Responsibly Irresponsible plan, we have also been saving for a Japan trip. In fact, it’s mostly ‘found’ money; coins we collect from our pockets every evening, some mileage expense money we get from our jobs, birthday money, a little bit from OneGiantStep…any ‘extra’ money that comes our way has been curried away into the OneGiantStep Goes To Japan fund. Yes, it’s actually named that at the bank. I am beyond excited. I’ve been poring over guidebooks, staying up late reading blog posts, and bookmarking and ‘pinning‘ everything I can find. The plan is for September; so there’s some time but just the thought of traveling again makes me dizzy! Have you been to Japan? I’m looking for recommendations…what did you do that worked? What didn’t work? Any must-sees? Or don’t-bothers? I’m all ears!! Good for you for saving enough and reaching a goal. Now if only the Japanese would start their 10,000 free airline tickets program that was bandied about last year. You’ve probably read Never Ending Voyage’s account of what they did in Japan – and if not, they are a terrific resource. Also check out Lash World Tour – she spent 6 years in Kyoto and would have lots to offer. I am SO excited for you guys, and you won’t be sorry you kept this trip in your back pocket for it’s own timeframe. I will send you what a brief outline of what we saw, and where we wished we had spent more time, but I am prepping for a Board (b-o-r-e-d) meeting so it will likely be sometime later. Do you want me to submit via the blog, or would you prefer a direct email with some scoop and taunting photos!? I will leave you with this for today – the Tokyo Great Cycling Tour – check it out! I would love to hear more about what you did in Japan. Do you think it’s too much for a comment here? It would be nice if others could benefit from your info too. If it’s too much then for sure drop it into an email (onegiantstep2009@gmail.com) for me. The Tokyo Great Cycling Tour looks like just the type of thing I would enjoy. I love small group tours where you can interact with others, see a large portion of the area and have a guide to help you understand it all! I’m looking forward to what else you have! We are soooo excited for you guys. Japan will be amazing, and there is nothing better than having a trip on the horizon. Can’t wait to read all about it! Oh, how exciting! I just got back from a two-week trip to Japan, and it was so lovely to be back there. It definitely was expensive (especially now that I’m making Chinese wages!) but, luckily, I had some “found” money too (in the form of the money I’d left behind in two bank accounts that I kept open when I left — that was a nice surprise!). I’d really recommend that you hike the Nakasendo trail in Nagano. That was maybe my most favorite trip that I ever took in Japan the 3 years that I lived there, and September will be a perfect time for it. It’s a bit tricky getting there, but definitely worth it. And the two restored post towns of Magome and Tsumago along the trail are very lovely. I’d also really suggest Nikko. I went there for the first time during my last trip and it was splendid. Tons of gorgeous temples & parks with a small town vibe. Plus, the hot springs at Yumoto Onsen (about an hour away by bus from Nikko) were really nice — and the perfect way to relax after a busy day of temple-hopping & hiking! Japan is one of my favorite country i want to visit someday. And i’m so happy for you guys. Just enjoy your trip and have fun. I’m excited to read more about your adventure in Japan. I’m looking forward on your next post. Exciting!! 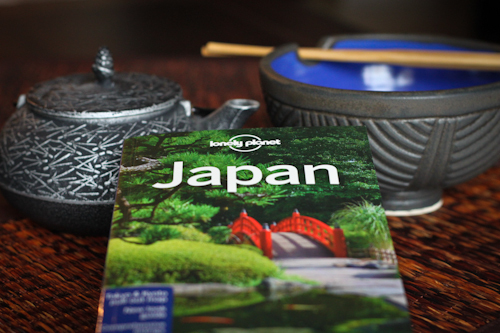 Andy really wants to go to Japan, so I’m looking forward to reading about your trip!